The air is crisp. The leaves are falling. Fall is here in full force. For many of us up north, that means facing a noticeable uptick in energy bills for the next few months as we crank up the heat in our homes. Install a smart thermostat: If you don’t have one already, now is the perfect time to buy a smart thermostat like the Carrier Côr. With Côr, you can set smart schedules so the heat isn’t on when you’re not home. It has a smart setback feature which lets the thermostat intelligently adapt beyond manual programming for greater efficiency, while still meeting ideal comfort levels. It even uses your home address to gather local weather data so it can make even smarter, energy-saving decisions! Check the settings on your water heater: Fun fact: most water heaters run 24/7 and at a scalding / unnecessarily high temperature. Adjusting the settings is easy and can go a long way to saving energy. If you’re in the market, pick up a Rheem EcoNet which can be adjusted from afar through the Wink app to lower your monthly bill even further. Create an ‘Energy Saving’ Shortcut or Robot: By bringing together your lightbulbs, Carrier Côr thermostat, and other smart products within a Wink Shortcut, it becomes much easier to turn off or adjust everything. With one tap in the app, you can lower the temperature and turn off the lights for bedtime. Or you can connect products together in a Wink Robot so that when you leave the house in the morning, your HVAC system knows to lower the temperature. Hopefully this helps keep the wallet a bit fuller this winter! We recently released a new app update for iOS and Android and with it, have brought two new products onto the Wink platform. We’re very excited about them and wanted to share a quick overview of the latest Wink partners! This WiFi-enabled wall plug lets you control small appliances up to 1800 watts, including lights, fans, and portable heaters, right through your smart phone. Its slim design fits any standard outlet so you can keep one outlet free, or plug in two. Forget to turn off the coffee maker or TV before leaving for work? With Wink, you can turn appliances plugged into your SmartPlug on or off in a pinch. You can also integrate iHome SmartPlug with existing Shortcuts or Robots for even more home automation possibilities. 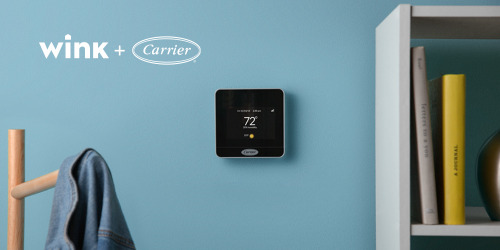 The Carrier® Côr™ is a smart thermostat designed to combine home comfort with reduced energy use. Its smart setback feature enables the Côr thermostat to adapt beyond manual programming for greater efficiency, while its energy reports give you in-depth information and tips on how you can save money. It even uses local weather data so it can make even smarter, energy-saving decisions. Try setting up an “Away” Shortcut in Wink that automatically adjusts the temperature of your Côr thermostat while ensuring other energy-hogging devices are turned off while you’re not home. Today, we’re really excited to let you know that the ecobee3 smart thermostat and remote sensors are now Wink-compatible! If you’re not familiar, ecobee3 intuitively understands when to turn on your HVAC system based on your home’s unique energy profile, your schedule, and the weather outside. What really makes it handy are the ecobee3 remote sensors. These little guys (one comes with your ecobee3 thermostat purchase and you can buy more) can be placed around your home and measure temperature and occupancy so you’re always comfortable in the rooms you’re actually using. With Wink, you can integrate ecobee3 into existing Shortcuts and Robots or monitor and adjust your home’s environment through the Wink app in a pinch. For example, a ‘Vacation’ Shortcut (especially helpful as we enter the busy holiday travel season) could be used to lower your ecobee3’s temperature, turn off the lights and ensure the front door is locked with one tap. Grab one today at Amazon or Home Depot!